The last volume of three books dedicated to private international law within the leading Asser-series in the Netherlands has just been published. Asser/Kramer & Verhagen, 10-III International vermogensrecht, Deventer: Kluwer 2015 (827 pages). It is authored by Xandra Kramer (Erasmus University Rotterdam) and Rick Verhagen (Radboud University Nijmegen/Clifford Chance), in collaboration with Sanne van Dongen and Paul Vonken (Radboud University Nijmegen). 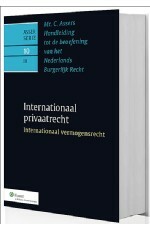 The book discusses Private International Law aspects of company law, agency, property law, trusts, contractual and non-contractual obligations from a Dutch, European and international perspective. More information is available here. A seminar dedicated to the publication of this book will take place at Clifford Chance in Amsterdam on 29 January 2015 (14-18 hrs), registration information is available here. It follows the publication of the first volume dedicated to general aspects of PIL: Asser/Vonken, 10-I Algemeen deel, Deventer: Kluwer 2013, authored by Paul Vonken, in collaboration with Rick Verhagen, Xandra Kramer and Sanne van Dongen and part two on international family and succession law: Asser/Vonken, 10-II Internationaal personen-, familie- en erfrecht, Deventer: Kluwer 2012, authored by Paul Vonken, in collaboration with Freek Schols (Radboud University Nijmegen).